Today I am sharing my chewy, buttery delicious chocolate chip cookie baked in a fun and festive heart shaped pan that you can make at home with a piece of foil! Topped with rich fudgy chocolate ganache and a custom monogram out of candy make it great for Valentine's day, an anniversary or to say "I love you". I baked my cookie in an 12" heart, but you can make it anywhere between 8-12 inches, just be sure to alter baking times accordingly. How about a giant heart pan for a Giant fudge brownie heart! 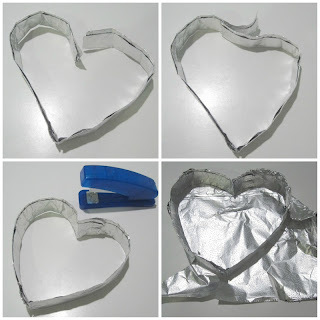 Overlap the top ends of the foil strip and fold them together creating the top fold in the heart. (Staple to hold the ends together if needed.) Shape foil into a heart with your hands until you have a nice rounded heart (it doesn't have to be perfect, you will re-shape at the end). Take another piece of foil and place it under your heart. Fold the bottom foil up the sides of the pan, OVER the top and back down the inside walls of the heart. Re-shape pan into a heart shape. Spray foil pan with non-stick spray and place in the middle of a slightly larger, baking pan/cake pan/cookie sheet. Prepare cookie dough and press into pan. 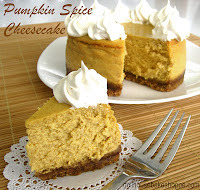 (recipe below). Bake as directed in a toaster oven or regular conventional oven. Let cool. Rip/cut away foil pan. Preheat oven to 325 degrees F. Line the bottom of a store bought 12" heart-shaped pan with parchment paper or create your own DIY disposable foil pan (directions shown above). Spread cookie dough along the bottom of the pan and bake about 15 minutes. (Depending on the size of your pan, you may need to adjust baking time.) While cookie is baking, prepare ganache. In saucepan, heat butter and cream over medium heat just until it starts to boil. Place chocolate chips in a small bowl and immediately pour just boiled cream on top. Let sit for a minute and stir until smooth. Remove cookie from oven and place on a wire rack to cool. Immediately press down on center of cookie with the back of a spoon, moving from the center out, creating a raised border around the perimeter of the cookie. Once cookie has cooled completely, run a knife along the edge of the pan and remove cookie (This can be done by taking the wire rack, placing it on top of the pan, and flip. Gently remove the pan. Then place your serving plate, face down, on top of the bottom of the cookie and flip over once more so the cookie is now face up.) Pour ganache over top of cookie into the indented center, and help spread it out toward edges with a spatula or knife. Place in the refrigerator to firm up. Once ganache has set and is firm, top it with M&M's and create your custom message. Slice like a cake, and enjoy!